Hotel Horizon Beach (4*) is located in a unique seafront location at the area of Stalis, between two lively towns, Hersonissos (3 km.) and Malia (5 km.). The international airport “Nikos Kazantzakis” is 30 km. and the port of Heraklion is 33 km. away. The hotel has 2 swimming pools, 2 childrens’ swimming pools, a wooden platform with direct access to the sea and a spa/wellness center. The first sandy beach is located 350 m. away from hotel. Horizon Beach Hotel is included from 250 rooms (204 double rooms and 46 family rooms) in 10 buildings (included the main building). All the rooms have balcony or terrace, air conditioning system, refrigerator, safe deposit box (with extra charge), satellite TV (free of charge), hairdryer and bathroom with bath or shower. In addition in the family rooms is provided also Kitchenette for better service for the families. For our young guests, the hotel has an outdoor playground and an outdoor play room. 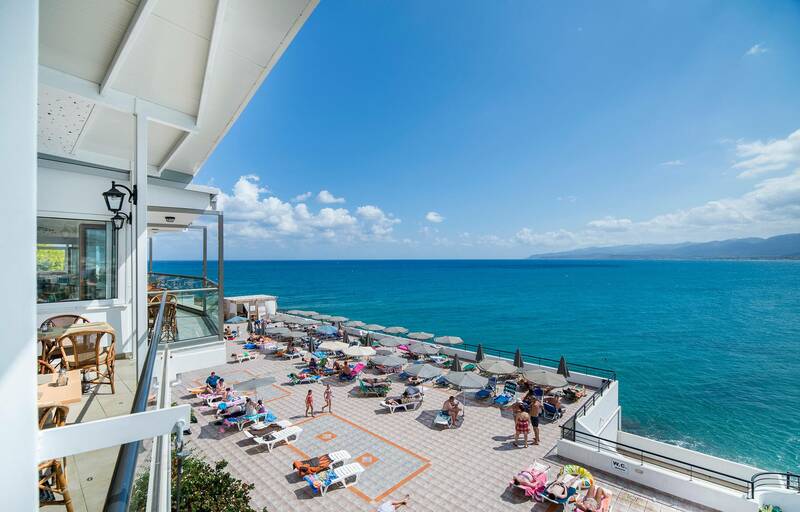 Hotel Horizon Beach, has one main restaurant that serves breakfast, lunch and dinner in rich buffets, a lobby bar and a snack-pool bar that serves the all inclusive drinks and snacks during the day. In our hotel you can find also a mini market for anything you need and also a souvenir shop for your memories from Crete.